CHICAGO — Timber Ridge Lodge & Waterpark in Lake Geneva, Wis., is a 225-suite property with a waterpark attached. The spacious suites and kid-friendly waterpark make the property a major draw for family vacations. The amenities also mean the property produces quite a bit of soiled terry and linen products. To process these goods, Timber Ridge uses an off-site, centralized laundry. On the other hand, White River Health System is a rural medical facility located in Batesville, Ark., that chose to handle its healthcare laundry on-site. Why does one business choose to use a centralized laundry service while another processes soiled goods in-house? American Laundry News spoke with representatives from both Timber Ridge Lodge & Waterpark and White River Health System to get the stories behind the laundry choices made, including the positive aspects and the challenges. In this post, White River Health System shares its laundry story. White River Health System’s in-house Laundry Service Department provides laundry and linen services to all the facilities in the system, which includes a 235-bed medical center with 35 internal distribution locations, a 25-bed rural medical center, a rural trauma emergency facility, 36 regional specialty clinics, and two regional medical complexes. Latus says that the on-premises laundry (OPL) has the ability to control the costs of linens through its group purchasing contacts. This also applies to the purchasing of chemicals and detergents. He adds that the maintenance department provides routine inspections on the equipment that help prevent mechanical issues that may develop. Another benefit Latus sees to White River Health System using an in-house laundry is the ability to secure employment opportunities for local residents. That’s not to say that there haven’t been challenges for the OPL. Latus says that prior to the construction of a new laundry facility in 2011, the department was faced with obstacles that prevented it from achieving its daily goals. 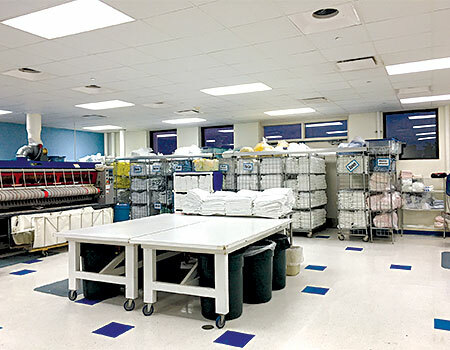 White River Health System’s current laundry operation processes more than 5,000 pounds of linen per day with a team of 13, according to Latus. The team works eight hours a day, five days a week, with a two-person in-house delivery-and-sort crew on weekends. He says challenges for the new operation are the “minor variables” that may come up on occasion. Another situation that can arise is a machine being down for repairs, which would quickly create a backlog of unprocessed linen. He says that every operation or process the laundry department can control and manage provides White River Health System the ability to control the expenses and outcomes. “It all cost nickels and dimes, but in the end, it’s all about how you manage your pennies,” Latus says. Miss Part 1 on use of a centralized service? Click here to read it.